The fate of the rest of the world is so tied to U.S. policy that throughout this election cycle, many people have joked that the whole world should be allowed to vote. Pollsters found that, if this had been allowed, the world would have voted overwhelmingly in favor of Obama. Most Americans say that the economy was the most important issue in this election, with the war in Iraq coming a distant second. What issues were most important to Obama’s global fans, and detractors? Beyond the celebrations in Kenya and formal congratulations offered by presidents and prime ministers, how are people in the rest of the world reacting to Obama’s victory? Obama’s opposition to the Iraq war has been central to his presidential campaign since day one. But Iraqi opinion is divided on his promise of a phased withdrawal of American troops. Some Iraqis say that the Obama victory represents a turn towards diplomacy and peace. But Foreign Minister Hoshyar Zebari fears that Obama “will not have the same enthusiasm and momentum for this situation” as President Bush has had. Throughout this election cycle, the McCain campaign has ridiculed Obama for his stance on Iran, repeatedly calling Obama “naive” for agreeing to talk with Iranian President Mahmoud Ahmadinejad “without preconditions.” Many Iranians are looking forward to an American president that is open to diplomacy. But one blogger makes the point that with a new American president who has expressed his willingness to talk, the Iranian regime “can’t keep making America their enemy.” Much of the Iranian government’s power is derived from its enmity with the U.S.
U.S.-Russia relations are sure to be on a short list of foreign policy challenges the Obama administration will be facing — perhaps sooner than they might have anticipated. While many world leaders sent hearty congratulations to the president-elect, Russian president Dmitry Medvedev must have been thinking along different lines when he announced on Wednesday that Moscow would station new short-range Iskander missiles in the Kaliningrad region between Poland and Lithuania. The deployment is in retaliation for the missile defense shield the U.S. plans to complete in Poland and the Czech Republic by 2011. No doubt disturbing to regional leaders, the Iskander is capable of carrying a tactical nuclear warhead. While Russia may be increasingly on Obama’s mind, the Russian people do not seem to be giving as much thought to him. According to a recently-released survey from the independent Levada Center, almost two-thirds of Russians didn’t care all that much about the U.S. presidential elections — 35 percent supported Obama, 14 percent were for McCain, 37 percent said they didn’t care who won, and 14 percent were undecided. Now that the election is over, “video postcards” from three Russians voice their hopes for a powerful president who will develop friendly relations with Moscow and not treat it just as a “consumer market.” Does this mean they don’t want our blue jeans anymore? China, home to one-fifth of the world’s population and America’s largest trading partner, was surprisingly absent as a foreign policy concern during the presidential campaign. But President-elect Obama will inevitably face the challenges posed by its emergence as an economic and military powerhouse. Opinion polls indicated two-thirds of Chinese people favored Obama, whose basic policy position is that America should not demonize China, but rather engage it constructively on a wide range of political and economic issues, all the while pressing the Chinese government to respect human rights. There is some concern in India regarding Obama’s view of the conflict between Pakistan and India over Kashmir. Obama stirred up mixed emotions in India when discussing his thoughts on Kashmir with MSNBC on November 3rd. 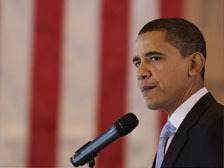 Obama stated “We should probably try to facilitate a better understanding between Pakistan and India and try to resolve the Kashmir crisis so that they can stay focused not on India, but on the situation with those militants.” Some people in India are concerned that U.S. involvement in the conflict would alter the already tenuous relationship between India and Pakistan, and potentially encourage Kashmiri militants and separatists. Latin American heads of state, from Michelle Bachelet in Chile to Brazilian President Luiz Inácio Lula da Silva were quick to congratulate Obama on his election victory, excited about his plan to rebuild U.S. leadership in a region that has been relatively ignored by the Bush administration. In Cuba, Fidel Castro published an editorial yesterday in the state-run newspaper Granma Internacional praising Obama as “without doubt more intelligent, cultured and calm than his Republican adversary,” but questioning his commitment to foreign affairs: “Concerns over the world’s pressing problems really do not occupy an important place in Obama’s mind.” Many Cuban citizens see a ray of hope for improved relations with the U.S. as Obama has promised to allow unlimited travel and remittances to the island by Cuban-Americans, and has expressed willingness to ease the five-decade embargo if Cuba takes significant steps toward democracy, beginning with the freeing all political prisoners. In a letter to Obama, Nelson Mandela wished him “strength and fortitude in the challenging days and years that lie ahead.” Mandela’s letter was a reminder of the immense expectations that the world has of Obama. “We trust that you will also make it the mission of your Presidency to combat the scourge of poverty and disease everywhere,” wrote Mandela. In both the primary and general election campaigns there was virtually no discussion on Africa policy. But according to one of Obama’s foreign policy advisers, Witney W. Schneidman, a top priority for Obama will be to end the genocide in Darfur. Given the domestic issues and war in both Afghanistan and Iraq it remains to be seen how much time and resources his administration will have to end the conflict in Sudan. It’s impossible to predict what Obama’s administration will bring in terms of US policy toward Africa, but Archbishop Tutu’s prediction at the University of Michigan will very likely hold true, “It is going to be a new epoch,” he said.